Msgr. 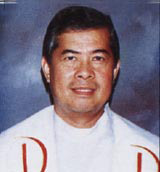 Domingo Cirilos Jr. is presently the parish priest of San Fernando de Dilao Parish in Paco, Manila , and the director of the Paco Catholic School . He served as Rector of the Manila Cathedral from 1985 to 1996 while holding two other positions in the archdiocese as oeconomus and moderator curiae of the Roman Catholic Archbishop of Manila (RCAM). During his term as a Rector, Msgr. Cirilos undertook special efforts to put Manila Cathedral in the most dignified form. He improved its sound system, put up a canopy at the right side of the altar, and initiated repairs of the church pillars, the walls, the floors, and the marble works. He also repaired the church roof, which had been damaged during the installation of airconditioning system in connection with the 1970 visit of Pope John Paul VI. Msgr. Pedrosa’s focus as a Rector was more on taking care of the cathedral and making it conducive to the official functions of the Archbishop. Concern for the spiritual life of the people was passed to the San Agustin Church located a block away and incidentally almost as old and as historical as the Manila Cathedral. In 1986, at the time when the Marcos dictatorship was increasingly shaken by the mounting political tide, the national office of the Commission on Elections (COMELEC) on General Luna Street was bombed. The explosion’s firepower shattered all the windows of the cathedral. All the stained glasses, highly prized for its artistic value, were pulverized. Msgr. Cirilos had to take charge of their replacement. Msgr. Cirilos also witnessed how the July 16, 1990 earthquake shook the cathedral. He was at the third floor of the rectory and he saw how the bell tower of the cathedral swung in perilous tempo with the full seismic rampage. The earthquake was so strong that the bell tower bent down. It became risky at the Cathedral after then as the damaged bell tower could fall anytime. Msgr. Cirilos commissioned the Consunji Construction to repair the tower. When later transferred to the Paco Church , Msgr. Cirilos would admit that the ease with which he would handle his new position owed much to the adequate administrative experience he learned while as Rector of the Manila Cathedral. The Paco Parochial School is the world’s biggest parochial school in terms of population.